Sailors Mike Fish and Martha Garczynski crossed from Ft. Lauderdale to The Bahamas aboard their 47-foot sailboat Layla in December, becoming the first vessel to clear Customs and Immigration at the Palm Cay Marina. 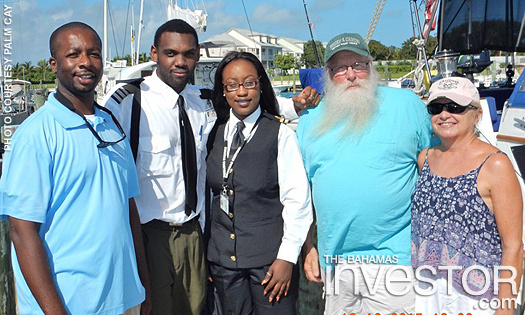 “It was a milestone for the marina and Mike and Martha were so pleased that they could sail directly into Palm Cay without having to clear at another destination or marina first,” said Palm Cay marina manager Demaro Demeritte. The marina, which opened in 2013, has attracted vessels from as far away as Australia and serves as the base for the busy NavTours charter fleet of some 24 sailboats. It is the largest marina serving mid-size boats and sportsfishing vessels on New Providence.